Every wedding photographer starts with one image. And for me, this is probably the first of the firsts I began with. More often or not, when somebody plans to start a wedding photography business, he or she would look for any opportunities to second shoot in order to gain more experience. Lucky for me, I happened to casually shoot my brother's wedding in the summer of 2013. 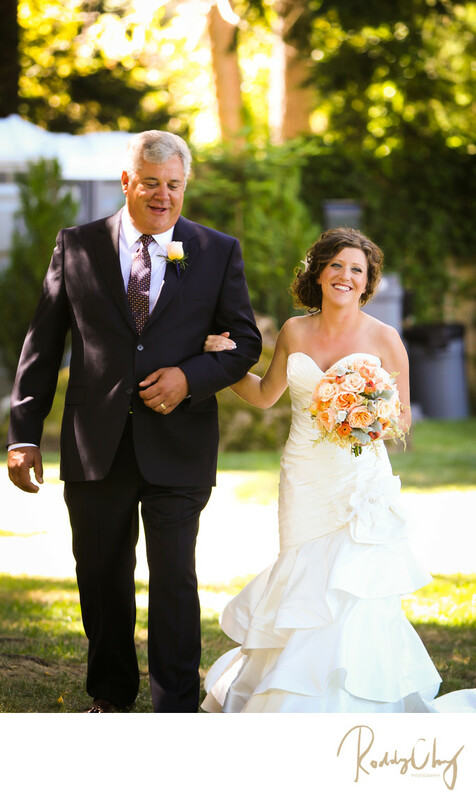 If you're a wedding photographer, you'd for sure hear about the story about Uncle Bob. Although I'm not that old, but I was that Uncle Roddy at the wedding, but at least I'm confident that I did not interfere with the actual photographers there! I'm from Lynden, Washington. And Semiahmoo was west of Lynden. So to be able to take some pictures that's so close to your hometown is a blessing since by then I have already lived in Seattle for more than a couple years. This is Jenn with her brother when she walked down the isle during the processional. I've know Jenn for a long long time. I still remember when my brother Niels started dating Jenn back in high school, Jenn was already off to College in Seattle since they were two years apart. I doubted him, "so you're going to do long distance relationship?" He only had a succinct one word response. "So?" Just when we were about to graduate from high school and choose our path for university life, Niels ended up going to UC Davis in California. Mom told me if they could get through this even longer distance relationship, they they will most likely to get married. From then, I have believed they are meant for each other. And I can't believe I've actually witnessed this moment and also had the honor to start my wedding photography career with the couple I've known for the longest time.